Developers CCP Cognac, CCP nLock and CCP Avalon will face off against Crossing Zebras Editor-in-Chief and GMVA head diplomat Niden, and Chaos Theory’s Drechlas in a testosterone-fueled competition to see who can grow the biggest and best beard before Fanfest. This isn’t a contest for the folically challenged, this is a contest for a man with the true blood of a viking flowing through his veins. The event, sponsored by Eve-Bet and Chaos Theory, begins today on Sunday, December 6th, with all five men grabbing scissors, clippers or a good old fashioned trimmer to trim their ultimate symbols of masculinity to 1 cm – it is winter in Iceland after all. From that point on it’s a race to cultivate not only a long beard but also a strong healthy one with the final measurement being made in Iceland at the first day of FanFest 2016, the winner receiving nothing but knowing they simply are the most manly of the group. These guys aren’t going to say goodbye to years of meticulous nurturing of their facial hair for nothing – it’s all going to be done to help raise ISK for Care 4 Kids. Care 4 Kids is a non-profit organisation dedicated to helping children who have to spend long periods of time in the hospital to “To provide a break and to drift away in our pixelspace game instead of feeling sad and being in pain.” The charity uses donations to create virtual care packages for the children containing 1 PLEX, 1 set of +3 implants and 100m ISK. Since its launch by Pandemic Legion’s C4w3 in September, the charity has grown to include 162 kids in eight wards at hospitals in six Swedish cities and two in the UK, with hopefully soon the first in the US. 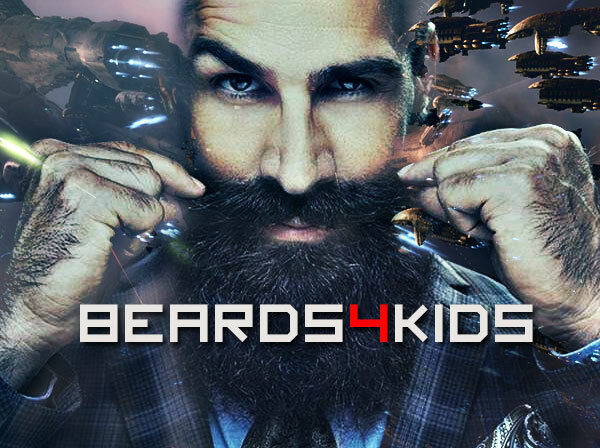 Although both sponsors have agreed to donate 30mil ISK per mm of beard growth amongst the five contestants it’s up to the Eve Online community to really make this event as much of a success as possible. Any alliance or corporation can choose to step in and sponsor in the same fashion as Eve-Bet and Chaos Theory. If you would like to sign up your alliance please send a mail to beards4kids@CrossingZebras.com with your alliance info and the amount of ISK you wish to sponsor with per mm. Sponsors will be announced through the coverage here on CZ and at Fanfest. To get personally involved all you need to do is pick the contestant you think will have the longest beard come Fanfest and send a minimum donation of 100m ISK to the corporation Beards For Kids. CCP will randomly draw three characters who donated money to the winner. They will each receive 2% of the total amount donated to Beards For Kids. If you have any questions, don’t hesitate to send a mail to beards4kids@CrossingZebras.com or an EVE mail to Master of Beards (CEO of the Beards For Kids corporation).